Langley Field is part of Joint Base Langley-Eustis (JBLE), located in Hampton, Virginia. It has a rich history in the Hampton Roads historic region and is the oldest continually active Air Force base in the world. The host unit on base is the 633rd Air Base Wing. Additional units include the 1st Fighter Wing, the 480th Intelligence Surveillance and Reconnaissance Wing and F-22 Raptor Demo Team. 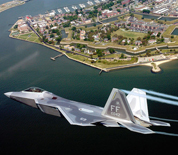 This Langley AFB directory features the critical info you’ll need to navigate through the many facilities and recreational opportunities available on base.